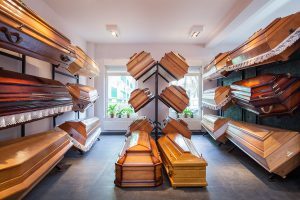 Since Funeral homes deal with human beings that have passed on for many different reasons, they have stringent regulations and requirements that a healthcare facility or any company that produces medical waste. Funeral home workers have the potential to be exposed to communicable and non-communicable diseases, chemicals, internal body fluids, and other things that could cause harm to themselves and the environment. In fact, medical waste in the funeral industry can include blood, medical devices, body parts, chemicals sharps, chemicals, pharmaceuticals, and radioactive materials. What Other Things in a Funeral Home is Considered Medical Waste? All items that come in contact with a deceased body need to be handled and disposed of properly- this includes using the appropriate sharps containers and medical waste disposal systems to ensure that any materials that could spread disease are no threat to employees, sanitation workers, or the general public. Each funeral director takes personal responsibility to ensure the proper disposal of the wastes generated based on federal, state, and local regulations. By partnering with a professional medical waste disposal company, you can minimize the risk of non-compliance, and ensure the safety of your employees and visitors. Medical Waste Pros can help you find a local provider that can provide medical waste containers, regularly scheduled pickups, and mailback systems, and ensure that you’re in compliance and protecting your employees to the best of your ability. Get a free quote today!